So, can you tell me about the Adventure Mode’s... actually, please tell me the title of the Adventure Mode. Sure. The Adventure Mode is called The Subspace Emissary. Can you tell me more about the development process for The Subspace Emissary? Well, first of all, there were a large number of players that wanted a storyline in Smash Bros. Melee. Generally speaking, this is a feature you won’t find in the games I design, but players were looking for more from the storyline. Because Smash Bros. brings together so many different characters though, developing a conventional storyline was going to be impossible. Each character comes from their own world, and there’s no end to their different restrictions and limitations. Right. Not only do they come from their own worlds, but an even more basic problem was the fact that it felt really strange to put someone like Mario and Link together in the same frame. The feel of the characters is different and, more importantly, it felt wrong to put characters with different head to body ratios side-by-side. It’s not so bad in a high action environment like the Brawl where everyone is moving all at once, but when I was writing the project plan document, I didn’t think it would be possible to make them look good together in a serious movie sequence. So you thought about giving up the idea. But then you decided to bring in a storyline. Right. The impetus for my decision was the side-scrolling mode in Smash Bros. Melee and I had been thinking about improving this feature from the beginning of planning. Then, while thinking about how I might make the side-scrolling mode more interesting for our players, I decided it was absolutely necessary to incorporate a sense of suspense to urge players on. Because the suspense of what happens next is what drives players most when playing a side-scrolling action game. Right. With older games, players were thrown into the game without any particular objective. With games nowadays though, you just can’t do that, leading me to the conclusion that we couldn’t have a game without a storyline. 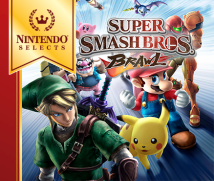 With Smash Bros., however, there are way too many characters and the game is made without a main character. Therefore, I had a really hard time figuring out how we might establish a storyline. At that point, I decided to ask Kazushige Nojima-san to help us since he had composed the scenarios for titles like Final Fantasy VII. 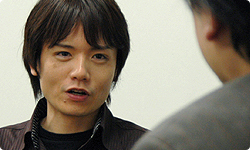 Wow, asking the person who crafted scenarios for Final Fantasy to write one for Smash Bros. is a pretty big deal. I know! (laughs) I didn’t ask him to write everything from scratch though. I explained the world of Smash Bros. and its characters and then asked for his help. The first storyline he came up with, however, wasn’t exactly what I was looking for. It was different than what you had envisioned. In other words, you came up with a storyline that neither of you could have produced on your own. Right. That’s something you might say about this entire game. This project is the result of people coming together and talents colliding. If we took one person and replaced them with another, the project would have definitely been different. That’s another reason the project was only possible this time around.